How are Key Performance Indicators applied to stock investments? We can use KPIs to define the things that matter. We’ll put more weight into these measures than others. In the last lesson, we saw that stock screening is an efficient way to create a list of stocks that may have investment potential. The next step is to see if these stocks meet our KPIs. If a stock doesn’t meet our KPIs, we won’t give it any more consideration. If a stock meets our KPIs we’ll let it pass through to our next filter which is stock chart analysis. KPIs give us a way to quickly determine if a stock may live up to our high standards. It’s a quality control check we can perform early on to weed out the weakest stocks. What Key Performance Indicators are most relevant to stock investments? So what factors have the biggest effect on earnings increases? The answer to this question will reveal our KPIs . . . Savvy investors consider sales to be the best measure of growth. Revenue drives earnings. From the equation above you can see that the greater the revenues the greater the profit. Our first KPI will be sales growth. Sales growth cannot be considered in isolation. It needs to be examined alongside profit margins so we can determine how much of an impact the sales growth will have on the company’s profit. With a company that normally operates with a higher profit margin. A smaller amount of sales growth will significantly improve profits. With a company that normally operates with a lower profit margin. A larger amount of sales growth will be needed in order to significantly improve profits. Profit margins tell us a lot more than just how the sales growth will affect profits. We’ll talk more about profit margins as we proceed. Note: Earnings Before Interest & Taxes is referred to as EBIT. We won’t specify operating margin as a KPI. We’ll just use it to assess the impact of sales growth on profits. Operating profit is the profit a company makes from the ongoing operations of the business. We are not particularly interested in the profit the company makes from outside interests. We need an idea of how much profit a company generates internally. For our operating profit measure, we’ll use Earnings Before Interest and Taxes (EBIT). EBIT is a useful profitability figure because it excludes the interest paid on loans and taxes paid to the government. Different companies have different capital structures. Some have more debt and therefore pay higher interest payments. Different companies also pay different rates of tax. By taking interest and tax out of the picture, operating profit comparisons between different companies become more relevant. We won’t include EBIT as a KPI. But we’ll consider it along with sales and EBIT margins just so that we can get more of a complete picture of the dynamics of the company’s profitability. To calculate operating profit (EBIT), from the company’s statement of financial performance, take the operating profit before tax figure. Then simply add net interest (“interest payments” minus “interest receipts”). So far, we’ve talked about three related key performance indicators. It’s good to look at these KPIs together. 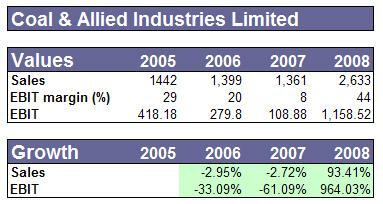 Let’s look at some figures for a resources company. So what can we learn from these figures? From 2005 to 2007 the sales were on a downward trend. What contributed to the decline in sales? We’ll look into that when we perform in-depth analysis at a later stage (assuming that this company makes it to that stage). In 2008 it looks like the company’s fortunes are turning around. A 93.41% year-on-year sales growth is significant. Again from 2005 to 2007 the EBIT margin was trending downwards. We’ll look for the cause of this decline in margins later on when we get to in-depth analysis. The 2008 margin is looking good at a healthy 44%. What contributed to improving margin? Later on folks. We can see that even though there was only a small relative difference in sales between 2005 and 2007. Profits were significantly different for that period. It’s obvious from looking at the numbers that the EBIT margin is the culprit in the context of this analysis. The 2008 EBIT is up a very strong 964.03% on the previous year. This is due to the significant improvements in both sales and margins. Operating profit (EBIT) is a key performance indicator. Note: We are only looking at one company in the example above. When you’re learning how to analyse companies, It’s a good idea to look at as many companies as possible to see how the dynamics of sales, profit margins and profits relate to each other. You should be able to see patterns between companies in the same industry. Earnings are an accounting representation of the profits earned by a business. The problem is that earnings don’t always reflect reality. Earnings need to be checked with cash flows to determine if the reported profits make sense. The easiest way to do this is to ensure that the operating cash flow is greater than reported earnings. For this KPI, operating cash flow must be greater than net profit. Cash flow is the life blood of a business. Strong cash flow from operations is not only a sign of financial health. But also a measure of raw profitability. The best companies generate more money than they need. The money left over after a company has paid its ongoing maintenance costs is referred to as free cash flow. Growing free cash flows tends to produce higher earnings. Our next KPI is free cash flow. Return On Capital is a measure of how effectively management is using the money invested in the business to generate profits. The company’s ROC history and current trend is our last KPI. We like to see that a company has a history of high returns on capital. If a firm meets our KPIs then it’s worthy of further consideration. The next step in the stock selection and analysis process is Stock Chart Analysis.